For the past 2 weeks sa has been consistently expensive. Queensland has been consistently cheap. Right now we have plenty of wind, exporting and it is still expensive. It's one thing to generate power cheaply, but another thing to transport it, and here in SA we have a "gold-plated network", the cost of which is added to our bills. Ross Garnaut is probably quite right about SA's power being cheaper to generate, but it doesn't necessarily relate to cheaper bills, as shown in the chart Bits has uploaded. 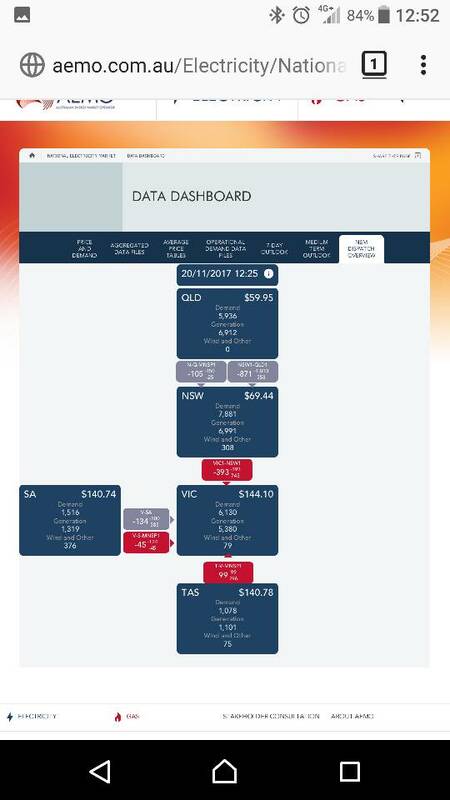 Power price seems related to the distance from Queensland you are. Not quite sure if this post belongs here, but I noticed this article the other day. Basically it seems that if Navantia or Fincantieri win the future frigates contract GE is planning on contract building the gas turbines here in Adelaide through Robin Johnson Engineering. A German shipbuilding company has won the $3.5 billion contract to design and build Australia's next fleet of 12 Offshore Patrol Vessels (OPVs), with construction to be shared between shipyards in Western Australia and South Australia. Looks like we're building the first two ships and the rest will be in WA. Good enough to see ASC through the "valley of death"
So we got lied to? Not really, the plan was always to build the first 2 OPVs in Adelaide to bridge the gap until the Future Frigates program starts around 2020 and then build the other 10 in Perth. SOUTH Australia’s unemployment rate has dropped to 5.9 per cent, still higher than the national average but better than the figures recorded in three other states. The Australian Bureau of Statistics today released its monthly update, which shows the national unemployment rate rose slightly to 5.5 per cent in December on a seasonally-adjusted basis. However, SA’s seasonal rate fell from 6.1 per cent to 5.9 per cent. That is better than Victoria, Queensland and Tasmania. On the less volatile trend figure, SA’s unemployment rate is steady at 5.9 per cent. That is better than WA and Tasmania, but above the national rate of 5.4 per cent. Jobs loom as one of the major issues for the March state election, after two years in which SA had the highest unemployment rate in the nation and Holden’s closure. Premier Jay Weatherill and the State Government has recently been rolling out a string of taxpayer-backed good news jobs announcements, including Violet Crumble’s return to SA. Employment Minister Kyam Maher said jobs were the Government’s top priority. “While I welcome the latest figures, there is always more work to be done,” he said. I've been on record before as saying I believe Victoria's economy is a house of cards, based entirely on huge unsustainable population growth, over- fuelling the housing market, allowing ordinary people to borrow against their home equity-for consumption, and providing inflated revenue to the government by property transactions and speculation. The cracks are starting to appear. SA on the other hand appears to be slowly turning the corner. I know some of my Victorian friends are mortgaged to the hilt, on homes 30km from the CBD, whose lifestyles and spending will be severely restricted should their house values drop, or heaven forbid, unemployment strikes. WA and Perth are doing so much better, every state should follow their example. Mining boom of the century and they blew it, now kicking and screaming about more GST revenue. have moved to Brisbane and Melbourne to look for jobs. That’s exactly It ghs, I understand what you’re trying to say. You’re saying that For a communist “let’s build the revolution together, comrades” party, this labor government do a pretty woeful job at getting people jobs. Maybe if they stopped pandering to the racist unions and maybe if the Liberal party started to actually have a stance or clear strategy on things, the economy would be better off. Or maybe it’s more to do with the noise of SA being drowned out by the Eastern states. E.g. Brisbane selling themselves as “Australia’s new world city” and the like. Story also in the AFR 22/1/18. He plans to develop the site into electric car production. At the fore front in Aust. Big plus for Adelaide.